What is improv? Improv, or improvisational theatre, is a type of acting where, instead of players memorizing scripts, they make up their lines as they go. 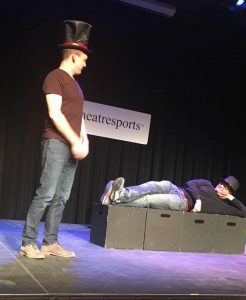 Improv often involves games – for example, perhaps a player must perform in a scene where he has to guess what strange crime he’s committed, and what celebrity was his criminal sidekick. You might have seen games like this on the improv TV series Whose Line Is It Anyway. It can also be used in longer formats which can stretch a scene out to the length of a full play. A great example is National Theatre of The World’s Impromptu Splendour or One Night Only a musical created on the spot, each night, by extremely impressive Toronto improvisers. Improv can also be used to create comedy sketches (this technique is used at Second City) or even feature-length movies (This Is Spinal Tap, Best in Show). Improv scenes are often comic – although they don’t have to be. Some scenes are serious. Directors like Mike Leigh (Secrets and Lies) have used improvisation to produce powerful drama, and the TV serial Train 48 was largely improvised. For the most part, Oakville Improv performances are comedy shows. Is it the same as standup comedy? No. Standup comedy usually involves one person delivering a scripted, or semi-scripted series of jokes to an audience. 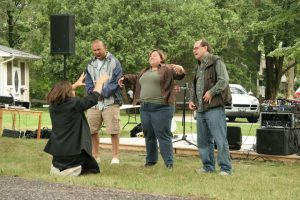 Improv typically involves a group of performers working together to produce scenes. Generally, it’s a more collaborative, scenic format versus a series of jokes. What happens at an improv workshop? The class usually consists of an instructor and a small group (typically 6-12 people). We play a lot of games. Many participants are nervous at first, so we start with easy games that may not look much like theatre – for example, you might be asked to clap at someone and make a noise, or people take turns to say the next word in a sentence. Gradually, we move into exercises that are more performance oriented. The atmosphere is very positive, everybody’s playing together. There’s no audience. Most people find it a gentle but fun introduction to performing. What kind of people get involved in improv? It’s an interesting mix. Some are naturally funny people looking for an outlet. Others are shy people who would like to be more confident. We have couples who joined so they could do something together, and actors who joined because they find improv provides an interesting alternative to scripted work. Artists and writers enjoy the creativity and storytelling. Many cerebral people are often drawn to improv – perhaps because it’s a way to use a different part of the brain. Over the years, we’ve worked with a surprising number of professors, doctors, programmers, and mathematicians. If I take your classes, will I get to perform on stage? Yes. Most of our workshops end with a “showcase” where you can apply what you’ve learned before a live audience. You can also join an improv team and compete in our ongoing “bubble tournament” which uses the Theatresports format, and you may also be invited to participate in our other Comedy Jams. What if I don’t want to perform on stage? It’s entirely optional – if you’d rather take the workshops and NOT perform in the show, that’s fine. And you can change your mind as you go. Many people start out determined not to perform on stage, and then soften as our workshop games make the fear of performing fade away. Either way, we’re betting you will find it an interesting experience. 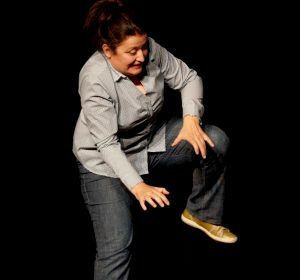 How does Oakville Improv differ from other improv classes I’ve seen offered? We offer an unusually high quality of instruction from professional improvisers and comedians. Our instructors are all comedy professionals, who have worked in improv for decades, and have worked on a variety of Canadian and US TV shows. We also bring in some of the best improv instructors from Toronto. Also, we perform regular improv shows, so the people who study improv with us have a place to put their skills to work. Do you need to be quick-witted? Surprisingly, no you don’t. We have some members who love jokes, but good improv is often less about coming up with “zingers” and more about listening carefully and responding in a natural way. The best improvisers are actually slowing down their thought processes and staying “in the moment”. They’re reacting in real time to what’s happening with their scene partner instead of worrying about what’s about to happen or how others are judging them. They are focused. Improv games and exercises can help you to do that. However, while you don’t need to be a fast thinker to perform improv, you will probably find you become better at making quick-witted comments in your daily life. I’m an actor already – will I learn anything useful? Many professional actors find that learning improv gives them a huge advantage in auditions, bringing out a playful, more natural style of performance. And, if you’re comfortable improvising, you’ll worry a lot less about forgetting your lines! What if the improvised scenes don’t work? Then the audience gets to watch a horrible scene – and that’s part of the fun. One reviewer compared improv to watching Formula One racing – “you go to watch the crashes”. That’s the unusual thing about improv – it’s enjoyable if you succeed, and if you fail, that can be fun too. What are the career prospects for improvisers? A few lucky souls get paid to do nothing but improv. However, most improvisers who make it a career end up using their skills in closely related areas – for example, as professional TV writers, actors, or sketch comedians. The founders of Oakville Improv, and most of our guest teachers, have taken this route, and a number of our other improv colleagues are now successful TV and film producers. Will it help me in a regular workplace? It might – especially if you’re in the kind of job where you need to think on your feet, or work collaboratively with others, or make presentations. One of our members is VP at a Fortune 500 company. She uses an improv game called “Yes And” with her team, and has found it an effective way to get people thinking and working together. Another used improv skills to improve his connections with his sales clients. We think so. One of the reasons we started Oakville Improv was to provide local improv workshops for our own kids, without them having to travel into Toronto. Improv is an outlet for kids like no other. Improv builds confidence, encourages creativity, and teaches listening skills, eye contact and cooperation.